Well, that didn’t take long. The S&P 500 is only down less than 5% from last month’s peak and already we’re seeing signs that this shallow correction has reached important levels. 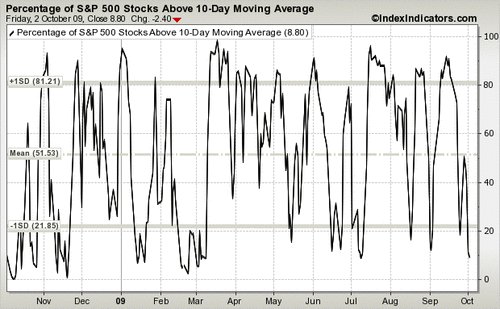 Take for example the percentage of stocks closing above their 10 day moving average. This simple breadth measure is surprisingly accurate at finding inflection points, both in the short and intermediate term. According to a study from Lowry Research which I shared with my readers a few years ago, it has an almost perfect track record: Latest Research Report From Lowry Research (2007). This wasn’t limited to just the most popular stock market index. Other indexes provided a similar outlook. Take for example the Nasdaq 100 index where 9% of the stocks closed above their 10 day moving average. Lowry’s operating company only version of this breadth measure was 8.13%, which is the lowest since March 2009. 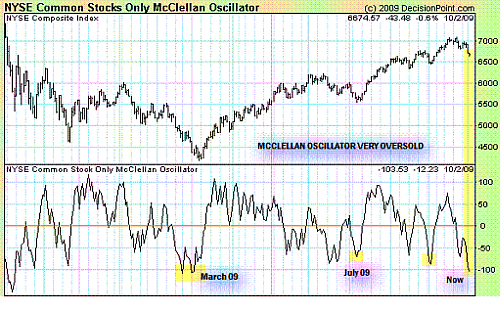 We can add to this the McClellan Oscillator which is another measure of market breadth. If we strip out the ETFs, CEFs, and other ‘junk’ from the NYSE and just consider real corporations, this operating company only index’s (Ratio Adjusted) McClellan Oscillator is as oversold as it was in March 2009. But other metrics like the short term average of the daily Nasdaq advance decline numbers are still quite high. So is the percentage of S&P 500 components which closed above their 50 day moving average. In an important bottom, this number can fall to 20% (and lower) but so far the lowest it has reached is a lofty 53.6%. A note of caution before you jump to conclusions. Interpreting this type of data can be rather tricky. That’s because these measures of internal market breadth act differently during different market conditions. In strong bull markets they can levitate for prolonged periods of time at atypically high levels. While in bear markets they oscillate with much more volatility. The best way to look at this market juncture is to see it as a litmus test of the spring rally. Just as we went over when we updated Lowry Research’s latest views on their intermediate buy signal, this correction was expected. The best way to take advantage of it is to see how the market reacts to it and specifically how the market internals deteriorate in the face of a decline in stock index prices. A shallow correction followed by a sharp rebound with very limited damage to the underlying breadth of the market would be a tell that this is a real cyclical bull market and not just a prolonged bear market rally. Also, Lowry’s proprietary ‘buying power’ index increased somewhat while ’selling pressure’ fell nominally.